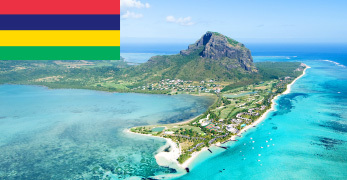 Situated in the Indian Ocean, approximately 800km off the East Coast of Madagascar, Mauritius is a political and financially stable and mature democracy which has actively sought and welcomed foreign investors and business for many decades. The banking, communications, financial and professional infrastructure is adept at meeting the demands of international business and tax practitioners. The population of the Island is approximately 1,250,000 made up principally by people of European, African, Indian and Chinese origin. Mauritius takes pride in the fact that these different cultures co-exist in peace and succeed in creating a cultural entity that is distinctly Mauritian. The British ruled Mauritius for 158 years until 12 March 1968 when it became an independent country within the Commonwealth. The Republic of Mauritius is a Westminster style democracy. The President is the Head of State and Commander in Chief. Full executive power rests with the Prime Minister who is Head of Government. The Members of Parliament are elected every five years by popular vote and a number of political parties contest the elections every five years, reflecting the country’s firm commitment to a multi-party political system. Mauritius Global Business Licence (GBC) Companies are resident in Mauritius and consequently subject to tax. However, they benefit from a partial tax exemption where foreign dividend income, foreign interest income are taxed at 3%. Correctly structured and managed Mauritius GBC companies may access Mauritius’ network of over 40 double tax avoidance treaties. Neither capital gains nor withholding taxes are levied. Consequently, Mauritius GBC companies are used by tax practitioners and businesses to structure investments into Mauritius’ treaty partners, which include South Africa, Namibia, Mozambique, Kenya, India and many more. Overseas income derived by a company engaged in ship and aircraft leasing provided the company satisfies such conditions as may be prescribed relating to the substance of its activities. If they are correctly structured and managed, Mauritius GBC companies may access Mauritius’ wide tax treaty network. Neither capital gains nor withholding taxes are levied. China, India, Indonesia, Luxembourg and Thailand. All companies seeking to benefit from this status are granted licenses on a case by case basis by the regulatory authorities in Mauritius. This procedure demands the submission of a detailed business plan and disclosure of beneficial ownership. Normally it takes about 3-4 weeks to set up a Mauritius GBC I Company. A Global Business Licence(GBC) company is resident for tax purposes and can access Mauritius’ network of double tax treaties, provided that it is correctly structured and that the seat of management and control is in Mauritius. Once name approval has been obtained, three copies of the Constitution (Memorandum and Articles of Association) are submitted, together with a notice of the First Directors, Secretary and location of the Registered Office, and consent forms signed by the Officers and a Legal Certificate issued by a law practitioner in Mauritius. A licence is required to undertake banking or insurance business, any financial services or solicit funds from the public. Yes, must be maintained in Mauritius at the address of a licensed management company. A suffix is not mandatory in Mauritius. Companies pay a fixed annual licence fee of US$ 1,750 and a one-off non-refundable licence application fee of US$ 500 to the Financial Services Commission. On incorporation a one-off fee of US$ 325 is payable to the Registrar of Companies for private companies. Thereafter a further US$ 325 is payable annually for private companies. Companies are resident in Mauritius for tax purposes. There is no capital gains taxation in Mauritius and there are no withholding taxes on the payment of dividends, interest or royalties from Companies. There are no stamp duties or capital taxes. Global Business Licence (GBC) companies are liable to taxes at a rate of 15%. Mauritius has an extensive double tax treaty network which includes treaties with the following countries: Belgium, Botswana, Croatia, Cyprus, France, Germany, India, Italy, Kuwait, Luxembourg, Madagascar, Malaysia, Mozambique, Namibia, Nepal, Oman, Pakistan, Rwanda, Singapore, South Africa, Sri Lanka, Swaziland, Sweden, Thailand, Uganda, UK and Zimbabwe. US$ 1,750 to the FSC. Global Business Licence (GBC) companies require a minimum of two Directors who must be natural persons resident in Mauritius. Mauritius Authorised Companies are tax exempt, flexible business entities that are regularly utilised for international investment holding, international property holding, international trade, international management and consultancy. An Authorised Company (AC) is not resident for tax purposes and do not have access to Mauritius’ tax treaty network. Beneficial ownership is disclosed to the authorities. The place of effective management must be outside of Mauritius, the activity of the company must be conducted principally outside of Mauritius and must be controlled by a majority of shareholders with beneficial interest being individuals who are not citizens of Mauritius. Cannot trade within the Republic of Mauritius with the majority of the shareholders being non-citizen and the place of effective management is outside of Mauritius. The usual authorised share capital is US$100,000 with all of the shares having a par value. An Authorised Company (AC) does not pay any tax on its world-wide profits to the Republic of Mauritius. A fee of US$ 150 on incorporation as license processing fees. First Annual License Fees for the period from the date of incorporation until the following 30th June is US$ 75 per month. Thereafter an Annual License Fee of US$ 350 to the FSC payable by the 30th of June of every year together with US$100 to the Registrar of Companies. An Authorised Company (AC) Companies is required to maintain financial statements to reflect their financial position with the Registered Agent and with the authorities. Annual return (return of income) must be filed with the Mauritius Revenue Authority (MRA) within 6 months of its balance sheet date.